A high-energy comedy marathon created, performed, and hosted by people of color across different ethnicities. 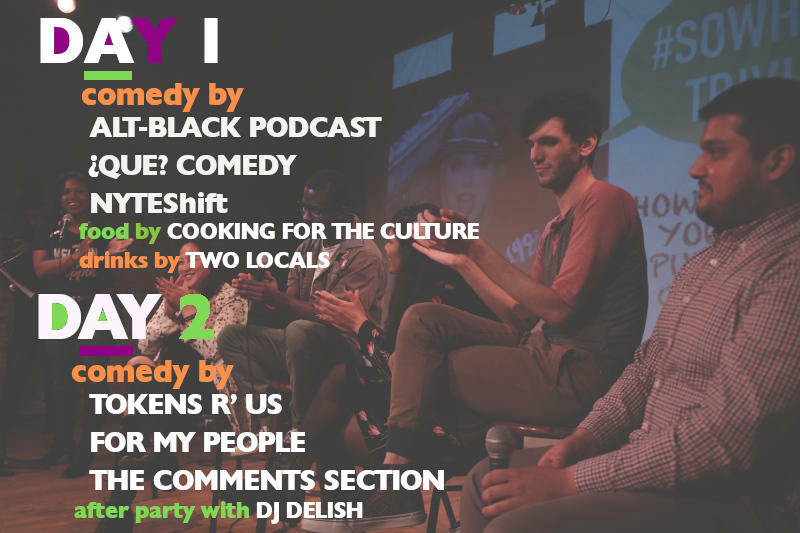 Two nights of funny shows produced & performed by comedians of color. Come for the shows and stay for the after-party. Participate in a comedy workshop & open mic. Festival kicks off with complimentary bites by Cooking For The Culture, free beer by Two Locals Brewery, and back-to-back comedy shows. Acts include ¿Que? Comedy, NYTEShift (formerly AmEx), and Alt-Black. Join us for a whole new lineup of shows including The Comments Section, Tokens R Us, and For My People. Stay for the after-party with DJ Delish. Keep The Beat is an improv workshop that focuses on keeping the rhythm, pace, and movement in comedy scenes. Looking to feel more present and have fun? Sign-up! All levels are welcome. Come participate in an experience consisting of panels, networking, and friend-making. In the spirit of the Pixel Palace, our presentation will be dynamic, engaging, and include lots of debate time with the audience! Make sure to join us afterward for a surprise performance. Watch these funny women werk the mic! A monthly standup & storytelling show created by and featuring Black women and women of color in comedy. Follow this show on Instagram to see highlights from recent shows. The comedy show where the minority rules. A panel of ethnically diverse comedians play games and tell stories of what it means to be the token—a non-white face in a white space. Hopefully, we'll all leave more culturally aware. Watch this video to see what to expect. Featured in 2018 FringeArts Festival, this Philly-based multicultural comedy troupe is giving a voice to folks of color through stand-up, sketch, and improv. Follow them on Instagram to see highlights from recent shows. ¿Qué? is a Philadelphia-based comedy group that does improv entirely in spanish, except for one white dude. They find the funny in miscommunication through their cross-cultural variety show, ¿Cómo Se Dice…? Follow them on Instagram to see highlights from recent shows. For My People is a comedy game show that tests your cultural aptitude, makes you feel "triggered", and keeps you in stitches all at once. The game pits two marginalized groups represented by a team of comedians against each other, for an opportunity to face The White Dudes. All events take place at Open Space, 1014 N Marshall St, Philadelphia, PA 19123 (near Girard Station on SEPTA Market-Frankford line). Kick off the festival with a happy hour sponsored by Two Locals Brewing Company and Cooks for The Culture. Enjoy free beer and a complimentary snack. Brandon Mitchell, Keane Cobb and Lemaire Lee open the festival with a live recording of their podcast Alt-Black, which gives you a glimpse into the life of an "Alternative" Black person. Philly's bi-lingual improv team ¿Que? hits the stage with their cross-cultural variety show, ¿Cómo Se Dice? Expect stand-up, sketch, and a round of improv done entirely in Spanish except for one "gringo" aka white dude. Closing out the evening with a perfect blend of improv, sketch, and variety plus a healthy dose of comedy that makes you laugh and think is multi-cultural improv team, NYTE Shift. Workshop takes place at The Art Dept, 1638 E Berks St, Philadelphia, PA 19125 (near Berks Station on SEPTA Market-Frankford line). Festival shows and after party takes places at Bourbon & Branch, 705 N 2nd St, Philadelphia, PA 19123 (near Spring Garden Station on SEPTA Market-Frankford line). Street parking available at all locations. Festival co-producers Chris Esperance & Ben Kuss show you how to create a foundation for group rhythm and scene work in improv. Each exercise will focus on patience, listening, and cadence. Can you keep up? You will be moving so bring comfy clothes and a water bottle. Instructors: Ben Kuss is a theater artist who has performed with Run Boy Run Productions and at the Allens Lane Art Center. Chris Esperance is an actor, comedian and co-producer of NYTEShift Comedy. Debuted at Good Good Comedy Theatre and featured at Brooklyn Comedy Collective to a sold-out crowd, Tokens R Us returns to Philly with an all new line-up of ethnically diverse comedians who play games and tell stories of what it means to be the token—a non-white face in a white space. Hopefully, you'll leave more culturally aware. The comedy game show that tests cultural aptitude, challenges stereotypes, and keeps you laughing all at the same time. An all-new lineup of comedians representing two marginalized groups go head-to-head for an opportunity to face The White Dudes. A monthly stand-up and storytelling show that features an all-new roster of funny women of color. Each show has a new theme and you can always expect a surprise. Plus, host Nicole Phoenix keeps the funny going with her podcast, The Comments Section Live. DJ Delish closes out the festival with non-stop, high energy beats and tunes! We're changing the face of comedy! We are adding more shows to the lineup. Stay tuned!